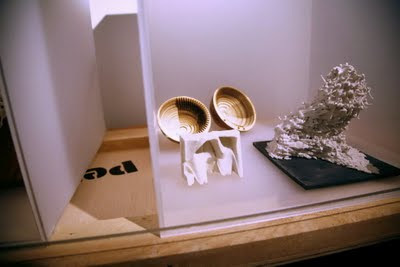 Guest critic at the Architectural Association (AADRL), UK. 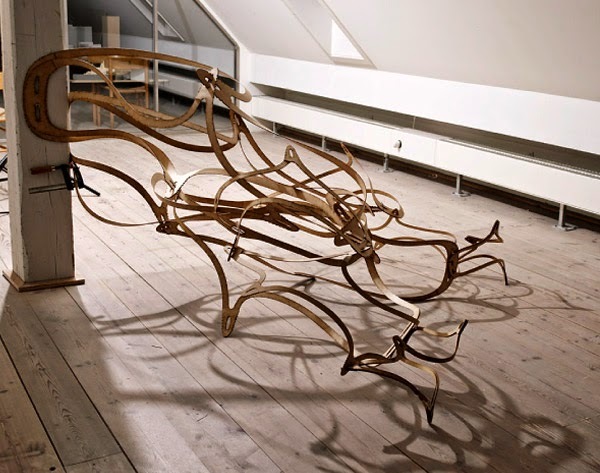 Critics included Patrick Schumacher, Ropert Soar, Marcos Cruz, Theo Spyropoulous, Marta Malle-Alemany, among others. 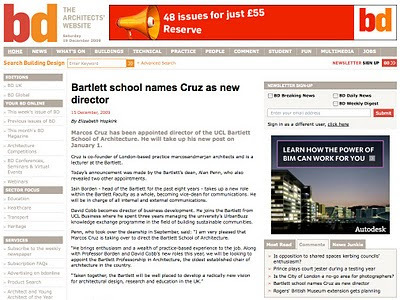 BD announces new Director of the Bartlett School of Architecture UCL, UK. 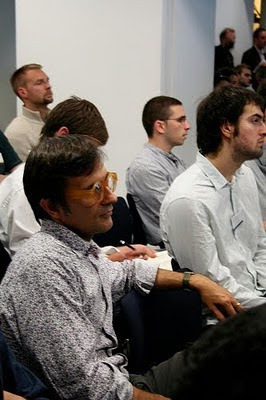 Seminar talk 'On Models' at the University of Westminster, London, UK. 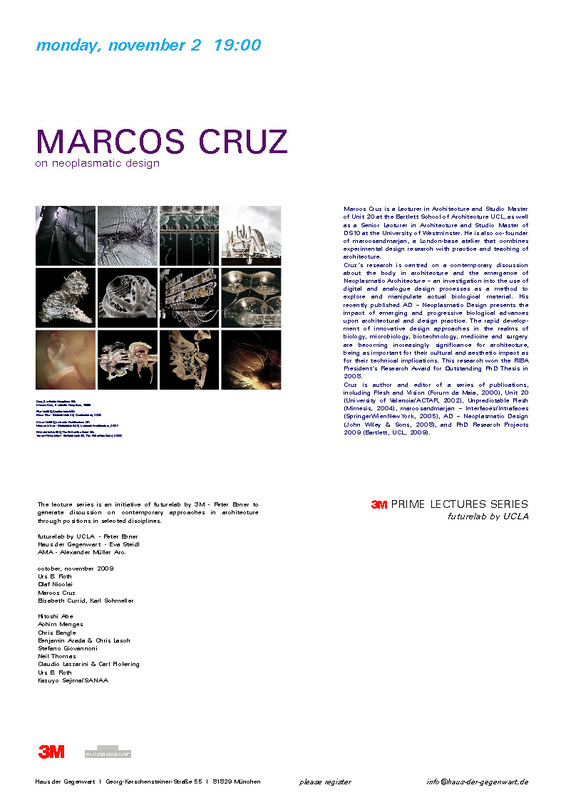 Lecture ‘Neoplasmatic Design’ at the 3M Prime Lecture Series, Haus der Gegenwart, Munich, Germany. Presentation and panel discussion at the Digital Architecture Conference, Building Centre, London, UK. Opening of Unit 20 exhibition at the Bartlett Summer Show, University College London, UK. Opening of DS10 exhibition at Open 09, University of Westminster, UK. CPD Presentation ‘Neoplasmatic Design’ at tp Bennett, London, UK. Presentation and panel discussion at Design Provocations / Creative Capital, Hospital Club, London, UK. Guest critic at the Architectural Association (AA Inter 3), UK. 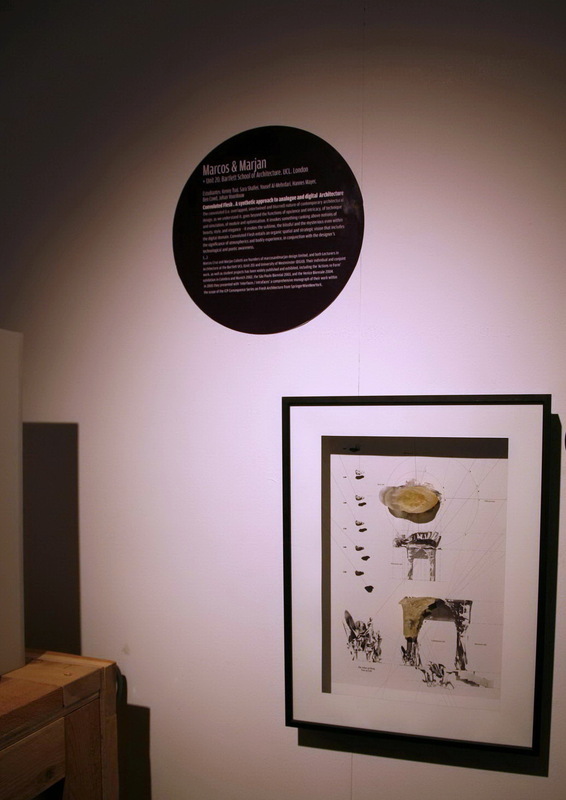 marcosandmarjan and Unit 20 work included in Perdidos exhibition at Fundación Arquitectura COAM, Madrid, Spain. Lecture ‘Crossing the Boundaries’, panel discussion and guest critic at Jornadas Internacionales, Universidad CEU San Pablo, Madrid, Spain. Lecture ‘Inlucent Interfaces/Inhabitable Interfaces’ and guest-critic (Studio Huang) at EPFL Lausanne, Switzerland. Critics included Jeffrey Huang, Bernard Cache, Marcos Cruz, among others. Critics inlcuded Peg Rawes, Gianluca Amadei, Andrei Martin, Damjan Iliev, Marjan Colletti, Marcos Cruz, Christiana Ioannou, and Christos Papastergiou. 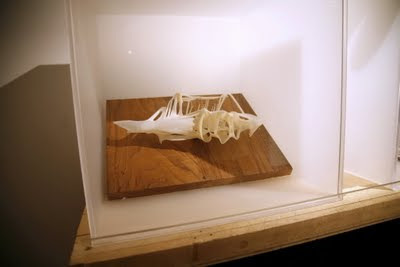 Lecture ‘The Body and the search for Inhabitable Interfaces’ at the University of Manitoba, Winnipeg, Canada. 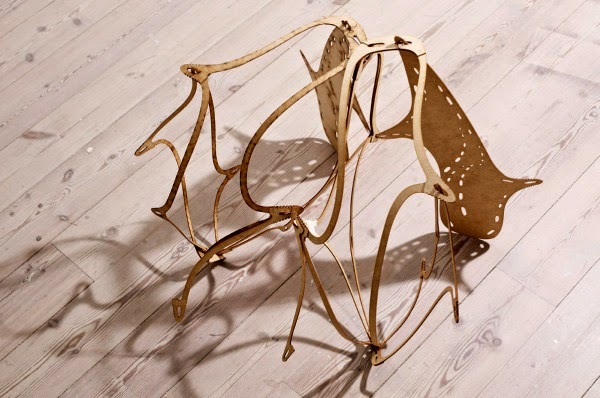 Critics included Andrei Martin, Laura Petruso, Ricardo de Ostos, Marjan Colletti, Kester Rattenbury, and Marcos Cruz. Lecture ‘Convoluted Flesh’ (back to back with M Colletti) at the Royal Danish Academy of Fine Arts School of Architecture, Copenhagen, Denmark. marcosandmarjan run a workshop at CITA - Royal Danish Academy of Fine Arts School of Architecture, Copenhagen, Denmark. Presentation and panel discussion at Living Architecture, Dana Centre/Science Museum, London, UK. 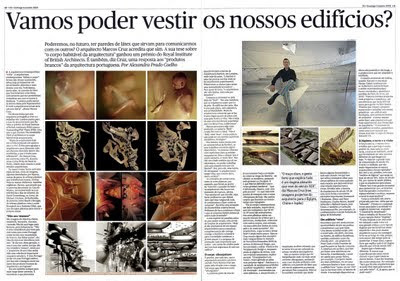 TV Broadcast about Marcos Cruz’s work on RTPN (interview with Isabel Lopes Gomes), Portugal. Lecture at Sobre as Ruinas do Futuro on the occasion of Fantasporto – Porto International Film Festival, Teatro Rivoli, Porto, Portugal. Student presentation and panel discussion about DS10 projects at the American University of Cairo, Egypt. Critics included Prof. Magda Mostafa, Dr. Amr Abdel Kawi, Dr. Omar Nagati, Arch. Yahia Shawkat, Dr. Marjan Colletti, among others. Review of Marcos Cruz’s work, Portugal.